Whereas Hodgkin lymphoma very rarely causes ocular disease, non-Hodgkin lymphoma (NHL) is the most common type of ocular lymphoma. Depending on the site of involvement, ocular lymphoma can be either intraocular or orbital and adnexal. Intraocular lymphoma (IOL) is a rare lymphocytic malignancy. It may be either a primary intraocular lymphoma (PIOL) or a secondary intraocular lymphoma (SIOL). PIOL is mainly a subtype of primary CNS lymphoma (PCNSL). SIOL results from ocular metastasis originating from outside the CNS. The most common presentation of intraocular lymphoma is decreased vision with nonresolving uveitis. Diagnosis is often based on obtaining an intraocular biopsy specimen. Optimal management is not yet realized. Chemoradiation is the most effective treatment, but significant ocular and cerebral morbidity is associated with its use. The prognosis for ocular lymphoma depends on the tumor’s histologic type and stage, as well as on the treatment employed. In general, with modern treatment of patients with NHL, the overall survival rate at 5 years is approximately 60%. Recent molecular studies demonstrating viral DNA in the ocular lymphoma cells suggest a role for infectious agents in the pathogenesis of intraocular lymphoma. Extramarginal zone lymphomas, which account for most primary orbital and adnexal lymphomas, are characterized by an indolent natural history with frequent, continuous extranodal relapses. Follicular lymphoma, diffuse large B cell lymphoma, mantle cell lymphoma, B-cell chronic lymphocytic leukemia, peripheral T-cell lymphoma, and natural killer cell lymphoma have also been reported to affect the orbit. Several hypotheses explain the increasing incidence of non-Hodgkin lymphoma (NHL). Better imaging techniques, improved biopsy techniques, and newer classification systems are likely to have contributed to the apparent increase in the incidence of lymphoma. The aging population, the increasing number of immunosuppressive drugs, and the AIDS epidemic have also contributed to the increased incidence of NHL. The symptoms reported differ according to whether the lymphoma is intraocular or orbital and adnexal. There are 2 distinct forms of intraocular lymphoma. When the ocular disease appears to be a subset of primary central nervous system (CNS) lymphoma (PCNSL), the term “primary CNS lymphoma with ocular involvement” (PCNSLO) is used. In these cases, intraocular lymphoma can precede CNS involvement by months or years. The second form of intraocular lymphoma arises outside the CNS and metastasizes to the eye. Intraocular lymphoma has been divided anatomically into vitreoretinal and uveal forms. The vitreoretinal form is associated with PCNSL and is typically a large B-cell tumor (intermediate-grade lymphoma). In contrast, the uveal form is associated with systemic NHL and also with involvement of orbital structures. It is typically small B-cell proliferation (low-grade lymphoma) and usually occurs with advanced systemic disease. Rare cases of T-cell lymphoma with ocular involvement have been reported. The typical clinical profile is an elderly patient with uveitis that is refractory to treatment. The most common subjective symptoms are painless decreased vision, photophobia, red eye, and floaters. In some patients with known PCNSL, ocular disease may be discovered on routine screening. Because of its insidious onset and ability to simulate other conditions, delay in diagnosis is common. Vision loss is frequent in PCNSLO and may range from mild to severe. With extensive disease, circulating tumor cells can appear in the anterior chamber in as many as 75% of patients. The cells simulate iridocyclitis and can even form a pseudohypopyon. Secondary anterior segment changes include neovascularization of the iris and iridocorneal angle with possible glaucoma. In rare circumstances, PCNSLO can form a mass in the iris or angle. In the posterior segment, vitreous cells are a typical finding and are present in most cases. The characteristic fundus lesion is a low-lying, yellow-to-white mass deep to the sensory retina. Lesions may be single or multiple, confluent or discrete. They may even appear as multiple punctate lesions. PCNSLO appears to occur with increased frequency in persons who are severely immunosuppressed. Orbital and ocular adnexal lymphoma has an insidious onset and can progress slowly for over a year before producing symptoms. Symptoms are usually secondary to pressure effects on surrounding structures. Clinical features include painless proptosis with or without motility disturbances, double vision, ptosis, and, rarely, decreased vision. The lesions can be unilateral or bilateral. Lymphomatous lesions can involve the preseptal portion of the eyelid. Orbital lymphomas present with painless proptosis, the lesions being more common in the anterior superior orbit. The mass is usually rubbery to firm on palpation with no palpable bony destruction. The lacrimal gland, lacrimal sac, and extraocular muscles can also be similarly involved. 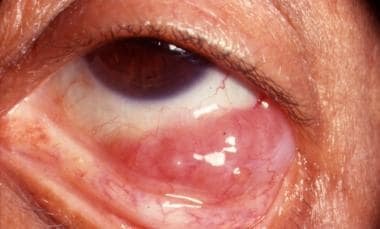 Conjunctival lymphoma has a characteristic salmon-pink appearance (see the image below). It may be an extension of orbital or intraocular lymphoma. Salmon-pink appearance of conjunctival lymphoma. The presence of cervical or preauricular lymphadenopathy, parotid gland swelling, or an abdominal mass can signify systemic disease. Hence, a thorough physical evaluation should be carried out in all patients with ocular lymphoma. The differential diagnosis for primary central nervous system lymphoma with ocular involvement (PCNSLO) includes reactive lymphoid hyperplasia (RLH), spread of systemic lymphoma, primary uveitis, infection, metastatic tumor, and amelanotic melanoma. All of these (except uveal melanoma) may not uncommonly have central nervous system (CNS) involvement. Primarily vitreoretinal involvement supports the diagnosis of PCNSLO, whereas primarily choroidal involvement and evidence of other non-Hodgkin lymphoma (NHL) supports metastatic spread to the choroid. Large cell intraocular lymphoma with retinal involvement can mimic cytomegalovirus retinitis. The differential diagnosis for orbital lymphoma include idiopathic inflammatory pseudotumor, orbital lymphoid hyperplasia, orbital sarcoidosis, Wegener granulomatosis, and chronic dacryoadenitis. A tuberculosis skin test is advisable. The serum lactate dehydrogenase (LDH) level is a prognostic indicator, with higher levels being indicative of a poorer prognosis. Enzyme-linked immunosorbent assay (ELISA) for HIV is also recommended. B-scan ultrasonography can show the presence of an intraocular mass. In addition, retinal detachment may be seen. Computed tomography (CT) and magnetic resonance imaging (MRI) have a low sensitivity for intraocular lymphoma and do not facilitate differentiating the diagnosis against uveitis or ocular melanoma. Evaluation of patients with intraocular lymphoma includes high-resolution neuroradiologic imaging of the central nervous system (CNS) with contrast to look for lesions elsewhere. CT scan and MRI have made it possible to make a strongly presumptive diagnosis of orbital lymphoid tumors. They are more reliable than B-scan ultrasonography in the diagnosis of orbital lymphoma. Positron emission tomography (PET) is useful in selected settings as well. Homogeneous isodense orbital mass molding around the lateral ocular surface. The lesion is usually extraconal but can extend intraconally as well. Lacrimal gland disease may involve both orbital lobes and palpebral lobes. The lacrimal sac  and extraocular muscles  may also be involved. A streaky appearance may be seen, which represents irregular infiltration of the microfascial structure of retrobulbar fat. Calcification is rarely seen. Heterogeneous lesions with bony destruction are indicative of high-grade lymphomas. Bilateral lesions are possible and can signify systemic disease. Orbital lesions are usually hypointense  or isointense on T1-weighted MRI and hyperintense on T2-weighted images. Gadolinium enhancement is seen on T1-weighted images. This is indicative of high cellularity. Lumbar puncture is indicated to obtain cerebrospinal fluid (CSF) for cytology if the patient is believed to have CNS lymphoma. Bone marrow aspiration is used for staging systemic lymphomas. CT scans of the chest and abdomen are obtained to rule out retroperitoneal lymphoma. Bone scans may also be done. Vitreous biopsy remains the mainstay of diagnosis for primary central nervous system lymphoma with ocular involvement (PCNSLO). Vitreous aspiration biopsy is a safe technique whose advantage is that it best preserves the cytomorphology. Material is aspirated directly through a 25-gauge needle into a syringe. A mechanical vitrector provides better management of the tissue during the procedure and also allows more specimens to be obtained. However, specimens are often diluted and appear to undergo some artifactitious change, since malignant lymphocytes are fragile to the effects of mechanical disruption. Material may also be lost in the tubing. If vitreous samples do not provide diagnostic tissue in the presence of retinal lesions, retinal and chorioretinal biopsies or subretinal aspiration may be done. Either an intraocular approach or a transscleral approach can be used. Biopsy of the lesion is essential to confirm the diagnosis and also to help grade the lymphoma. The diffuse infiltrating nature of lymphomas may make their complete excision difficult. Also, their excellent response to irradiation obviates the need for complete excision. The route of biopsy is chosen depending on the site of the lesion. Direct approach is possible for conjunctival and lid lesions, whereas orbitotomy is needed for lesions involving the lacrimal gland or posterior orbit. In the case of bilateral disease, only 1 orbit need undergo biopsy. A key factor in obtaining an accurate diagnosis of intraocular lymphoma is a cytopathologist with experience in intraocular specimens. Mucosa-associated lymphoid tissue (MALT) lymphoma, diffuse large cell lymphoma, and small lymphocytic lymphoma are some common types of intraocular lymphoma. Because of the fragility of neoplastic lymphocytes, a specimen may contain numerous abnormal-appearing but uninterruptable cells. Tumor cells can involve the vitreous, retina, optic nerve, or choroid. They are found less often in the anterior segment. Choroidal involvement by primary central nervous system lymphoma with ocular involvement (PCNSLO) is typically diffuse, whereas retinal involvement may be more perivascular. When present, retinal necrosis can be extensive. Molecular analysis detecting immunoglobulin gene rearrangements and ocular cytokine levels showing elevated interleukin (IL)–10 (IL-10), with an IL-10–to–IL-6 ratio greater than 1.0, are helpful adjuncts to cytology for establishing the diagnosis of PCNSLO. CDR3 polymorphism analysis is recommended to confirm clonality. Extranodal marginal zone B-cell lymphoma represents the most common orbital lymphoma subtype. [41, 42] Most patients with ocular adnexal lymphoma have stage IE disease. Immunohistochemical staining with CD markers helps classify lymphomas. Gross specimens appear salmon-colored with a fish-flesh consistency. Hypercellular proliferations are seen with sparse stroma. Immunologic identification of cell surface markers on lymphocytes can be used to classify tumors as containing T or B cells and as being monoclonal or polyclonal in origin. The vast majority of orbital lymphomas are of B-cell origin with monoclonal proliferation from a single neoplastic cell. Well-differentiated monoclonal lesions have associated systemic disease in 20% of cases, while the association increases to 60% with less well-differentiated lesions. Because of the high recurrence rate and refractory nature of primary central nervous system lymphoma with ocular involvement (PCNSLO), treatment is difficult. However, treatment of intraocular lymphoma underwent a significant advance with the introduction of chemoradiation to the central nervous system (CNS) and ocular radiation. Research is ongoing to determine if lower doses of local radiation are effective and still reduce associated complications. Radiotherapy alone is a highly effective modality in the curative management of primary orbital lymphoma. Bilateral orbital disease itself, in the absence of systemic disease, is not an indication for chemotherapy. In cases of massive orbital involvement, both chemotherapy and radiation therapy can be simultaneously given. Antiangiogenic drugs, such as thalidomide, are also being researched for use in lymphoma treatment, as they are shown to slow the growth of cancer cells. Neurologic evaluation is required in patients with intraocular lymphoma to rule out CNS involvement. Patients with ocular lymphoma should be referred to the clinical oncologist for evaluation of systemic lymphoma. Close clinical follow-up every 6 months for 2 years upon completion of treatment and annually thereafter is recommended. The evaluation should include neuroimaging studies (eg, ultrasonography, computed tomography [CT], or magnetic resonance imaging [MRI] of the orbits) to look for residual or recurrent local disease. Serial imaging can be a very useful tool for detecting recurrence. Residual fibrosis of involved extraocular muscles or other orbital structures can appear similar to tumor. Whether re-biopsy or exploration is indicated should be a clinical decision, often aided by serial imaging. A clinical oncologist should also follow up with the patient for a thorough systemic evaluation every 6 months for 2 years and annually thereafter. Death can occur as a result of the systemic spread of lymphoma. Prior or concurrent systemic disease has been noted as the most significant predictive factor for lymphoma-related death, but tumor-related death was also found to be more common and earlier with bilateral disease. Tumor-related death is slightly less where symptoms have been present for more than a year and slightly greater in the elderly. Patients with primary central nervous system lymphoma with ocular involvement (PCNSLO) have a poor prognosis even with chemoradiation, and many succumb to central nervous system (CNS) disease within 2 years. Yet, median survival of primary central nervous system lymphoma (PCNSL) has increased from 1-1.5 years to over 3 years with newer therapies. Features affecting the prognosis of PCNSLO are not well understood. Death ensues by CNS dissemination. Ocular lymphoma may be the initial manifestation of PCNSL. With radiotherapy for orbital disease, the 5-year disease-free survival and overall survival rate has been between 65-73.6% and 65.5-78%. [47, 53] Most relapses occur in the first 2 years after therapy. The risk of late relapse is higher in patients with a divergent histology of both indolent disease and aggressive disease. Intraocular lymphoma can lead to blindness due to damage of the intraocular structures involved. Orbital lymphoma can cause blindness in untreated or aggressive cases with severe proptosis leading to corneal complications or optic neuropathy. Local irradiation can also cause reversible blindness due to cataract and irreversible blindness in cases of radiation-induced optic neuropathy and retinopathy. What is intraocular lymphoma (IOL)? What are orbital and adnexal lymphoma? What is ocular lymphoma classified? What are the survival rates for ocular lymphoma? What is the pathophysiology of ocular lymphoma? What is the prevalence of ocular lymphoma? Which age group has the highest prevalence of ocular lymphoma? What are the sexual and racial predilections of ocular lymphoma? What are the signs and symptoms of ocular lymphoma? What are the forms of intraocular lymphoma? Which clinical history findings are characteristic of primary CNS lymphoma with ocular involvement (PCNSLO)? Which clinical history findings are characteristic of ocular metastatic systemic lymphoma? Which clinical history findings are characteristic of orbital and adnexal lymphoma? Which conditions are included in the differential diagnoses of primary central nervous system lymphoma with ocular involvement (PCNSLO)? How is primary central nervous system lymphoma with ocular involvement (PCNSLO) differentiated from ocular metastatic systemic lymphoma? How is conjunctival lymphoma differentiated from chronic conjunctivitis? Which conditions are included in the differential diagnoses of orbital lymphoma? What is the role of lab tests in the workup of ocular lymphoma? What is the role of imaging studies in the workup of intraocular lymphoma? What is the role of imaging studies in the workup of orbital and adnexal lymphoma? What is the role of lumbar puncture in the workup of ocular lymphoma? What is the role of vitreous biopsy in the workup of ocular lymphoma? What is the role of retinal biopsy in the workup of ocular lymphoma? What is the role of orbital biopsy in the workup of ocular lymphoma? Which histologic findings are characteristic of ocular lymphoma? How is intraocular lymphoma treated? How are orbital and adnexal lymphoma treated? Which specialist consultations are beneficial to patients with ocular lymphoma? What is included in the long-term monitoring of ocular lymphoma? What is the prognosis of ocular lymphoma? Valvassori GE, Sabnis SS, Mafee RF, Brown MS, Putterman A. Imaging of orbital lymphoproliferative disorders. Radiol Clin North Am. 1999 Jan. 37(1):135-50, x-xi. [Medline]. Shields JA, Shields CL, Scartozzi R. Survey of 1264 patients with orbital tumors and simulating lesions: The 2002 Montgomery Lecture, part 1. Ophthalmology. 2004 May. 111(5):997-1008. [Medline]. Bonavolontà G, Strianese D, Grassi P, Comune C, Tranfa F, Uccello G, et al. An analysis of 2,480 space-occupying lesions of the orbit from 1976 to 2011. Ophthal Plast Reconstr Surg. 2013 Mar-Apr. 29(2):79-86. [Medline]. Ahmed S, Shahid RK, Sison CP, Fuchs A, Mehrotra B. Orbital lymphomas: a clinicopathologic study of a rare disease. Am J Med Sci. 2006 Feb. 331(2):79-83. [Medline]. Özkan MC, Palamar M, Tombuloğlu M, Hekimgil M, Özsan N, Saydam G, et al. Ocular Adnexal Lymphomas: Single-Center Experience. Clin Lymphoma Myeloma Leuk. 2015 Jun. 15 Suppl:S158-60. [Medline]. Russell-Jones R. World Health Organization classification of hematopoietic and lymphoid tissues: implications for dermatology. J Am Acad Dermatol. 2003 Jan. 48(1):93-102. [Medline]. Rosado MF, Byrne GE Jr, Ding F, Fields KA, Ruiz P, Dubovy SR, et al. Ocular adnexal lymphoma: a clinicopathologic study of a large cohort of patients with no evidence for an association with Chlamydia psittaci. Blood. 2006 Jan 15. 107(2):467-72. [Medline]. Chanudet E, Zhou Y, Bacon CM, Wotherspoon AC, Muller-Hermelink HK, Adam P, et al. Chlamydia psittaci is variably associated with ocular adnexal MALT lymphoma in different geographical regions. J Pathol. 2006 Jul. 209(3):344-51. [Medline]. Moslehi R, Devesa SS, Schairer C, Fraumeni JF Jr. Rapidly increasing incidence of ocular non-hodgkin lymphoma. J Natl Cancer Inst. 2006 Jul 5. 98(13):936-9. [Medline]. National Cancer Institute. Surveillance, Epidemiology, and End Results Cancer Fact Stat Sheet, Cancer of the Eye and Orbit. Available at http://seer.cancer.gov/statfacts/html/eye.html. Accessed: 2008. Jardel P, Caujolle JP, Gastaud L, Maschi C, Sauerwein W, Thariat J. [Malignant tumours of the eye: Epidemiology, diagnostic methods and radiotherapy]. Cancer Radiother. 2015 Oct 21. [Medline]. Shikishima K, Kawai K, Kitahara K. Pathological evaluation of orbital tumours in Japan: analysis of a large case series and 1379 cases reported in the Japanese literature. Clin Experiment Ophthalmol. 2006 Apr. 34(3):239-44. [Medline]. Ko YH, Kim CW, Park CS, Jang HK, Lee SS, Kim SH, et al. REAL classification of malignant lymphomas in the Republic of Korea: incidence of recently recognized entities and changes in clinicopathologic features. Hematolymphoreticular Study Group of the Korean Society of Pathologists. Revised European-American lymphoma. Cancer. 1998 Aug 15. 83(4):806-12. [Medline]. Seregard S, Sahlin S. Panorama of orbital space-occupying lesions. The 24-year experience of a referral centre. Acta Ophthalmol Scand. 1999 Feb. 77(1):91-8. [Medline]. Burnier MN Jr, Stockl FA, Dolmetsch AM. Large B-cell lymphoma of the retina and CNS. Presented at the 1994 Annual Meeting of the Eastern Ophthalmic Pathology Society, Boston, Mass. October 1994. Levy-Clarke GA, Chan CC, Nussenblatt RB. Diagnosis and management of primary intraocular lymphoma. Hematol Oncol Clin North Am. 2005 Aug. 19(4):739-49, viii. [Medline]. Schabet M. Epidemiology of primary CNS lymphoma. J Neurooncol. 1999 Jul. 43(3):199-201. [Medline]. Demirci H, Shields CL, Shields JA, Honavar SG, Mercado GJ, Tovilla JC. Orbital tumors in the older adult population. Ophthalmology. 2002 Feb. 109(2):243-8. [Medline]. Char DH, Ljung BM, Miller T, Phillips T. Primary intraocular lymphoma (ocular reticulum cell sarcoma) diagnosis and management. Ophthalmology. 1988 May. 95(5):625-30. [Medline]. Char DH, Margolis L, Newman AB. Ocular reticulum cell sarcoma. Am J Ophthalmol. 1981 Apr. 91(4):480-3. [Medline]. Whitcup SM, de Smet MD, Rubin BI, Palestine AG, Martin DF, Burnier M Jr, et al. Intraocular lymphoma. Clinical and histopathologic diagnosis. Ophthalmology. 1993 Sep. 100(9):1399-406. [Medline]. Peterson K, Gordon KB, Heinemann MH, DeAngelis LM. The clinical spectrum of ocular lymphoma. Cancer. 1993 Aug 1. 72(3):843-9. [Medline]. Freeman LN, Schachat AP, Knox DL, Michels RG, Green WR. Clinical features, laboratory investigations, and survival in ocular reticulum cell sarcoma. Ophthalmology. 1987 Dec. 94(12):1631-9. [Medline]. Mansour AM. Adnexal findings in AIDS. Ophthal Plast Reconstr Surg. 1993 Dec. 9(4):273-9. [Medline]. Reifler DM, Warzynski MJ, Blount WR, Graham DM, Mills KA. Orbital lymphoma associated with acquired immune deficiency syndrome (AIDS). Surv Ophthalmol. 1994 Jan-Feb. 38(4):371-80. [Medline]. Neudorfer M, Kessler A, Anteby I, Goldenberg D, Barak A. Co-existence of intraocular and orbital lymphoma. Acta Ophthalmol Scand. 2004 Dec. 82(6):754-61. [Medline]. Akpek EK, Polcharoen W, Ferry JA, Foster CS. Conjunctival lymphoma masquerading as chronic conjunctivitis. Ophthalmology. 1999 Apr. 106(4):757-60. [Medline]. Küker W, Herrlinger U, Gronewäller E, Rohrbach JM, Weller M. Ocular manifestation of primary nervous system lymphoma: what can be expected from imaging?. J Neurol. 2002 Dec. 249(12):1713-6. [Medline]. Flanders AE, Espinosa GA, Markiewicz DA, Howell DD. Orbital lymphoma. Role of CT and MRI. Radiol Clin North Am. 1987 May. 25(3):601-13. [Medline]. Sjo LD, Ralfkiaer E, Juhl BR, Prause JU, Kivela T, Auw-Haedrich C, et al. Primary lymphoma of the lacrimal sac: an EORTC ophthalmic oncology task force study. Br J Ophthalmol. 2006 Aug. 90(8):1004-9. [Medline]. Hornblass A, Jakobiec FA, Reifler DM, Mines J. Orbital lymphoid tumors located predominantly within extraocular muscles. Ophthalmology. 1987 Jun. 94(6):688-97. [Medline]. Yeo JH, Jakobiec FA, Abbott GF, Trokel SL. Combined clinical and computed tomographic diagnosis of orbital lymphoid tumors. Am J Ophthalmol. 1982 Aug. 94(2):235-45. [Medline]. Sullivan TJ, Valenzuela AA. Imaging features of ocular adnexal lymphoproliferative disease. Eye. 2006 Oct. 20(10):1189-95. [Medline]. Akansel G, Hendrix L, Erickson BA, Demirci A, Papke A, Arslan A, et al. MRI patterns in orbital malignant lymphoma and atypical lymphocytic infiltrates. Eur J Radiol. 2005 Feb. 53(2):175-81. [Medline]. Valenzuela AA, Allen C, Grimes D, Wong D, Sullivan TJ. Positron emission tomography in the detection and staging of ocular adnexal lymphoproliferative disease. Ophthalmology. 2006 Dec. 113(12):2331-7. [Medline]. Roe RH, Finger PT, Kurli M, Tena LB, Iacob CE. Whole-body positron emission tomography/computed tomography imaging and staging of orbital lymphoma. Ophthalmology. 2006 Oct. 113(10):1854-8. [Medline]. English JF, Sullivan TJ. The Role of FDG-PET in the Diagnosis and Staging of Ocular Adnexal Lymphoproliferative Disease. Orbit. 2015 Oct. 34 (5):284-91. [Medline]. Buggage RR, Chan CC, Nussenblatt RB. Ocular manifestations of central nervous system lymphoma. Curr Opin Oncol. 2001 May. 13(3):137-42. [Medline]. Coupland SE, Hummel M, Stein H. Ocular adnexal lymphomas: five case presentations and a review of the literature. Surv Ophthalmol. 2002 Sep-Oct. 47(5):470-90. [Medline]. Norton AJ. Monoclonal antibodies in the diagnosis of lymphoproliferative diseases of the orbit and orbital adnexae. Eye. 2006 Oct. 20(10):1186-8. [Medline]. Coupland SE, Krause L, Delecluse HJ, Anagnostopoulos I, Foss HD, Hummel M, et al. Lymphoproliferative lesions of the ocular adnexa. Analysis of 112 cases. Ophthalmology. 1998 Aug. 105(8):1430-41. [Medline]. Valluri S, Moorthy RS, Khan A, Rao NA. Combination treatment of intraocular lymphoma. Retina. 1995. 15(2):125-9. [Medline]. Plowman PN, Montefiore DS, Lightman S. Multiagent chemotherapy in the salvage cure of ocular lymphoma relapsing after radiotherapy. Clin Oncol (R Coll Radiol). 1993. 5(5):315-6. [Medline]. Fishburne BC, Wilson DJ, Rosenbaum JT, Neuwelt EA. Intravitreal methotrexate as an adjunctive treatment of intraocular lymphoma. Arch Ophthalmol. 1997 Sep. 115(9):1152-6. [Medline]. Bhatia S, Paulino AC, Buatti JM, Mayr NA, Wen BC. Curative radiotherapy for primary orbital lymphoma. Int J Radiat Oncol Biol Phys. 2002 Nov 1. 54(3):818-23. [Medline]. Liao SL, Kao SC, Hou PK, Chen MS. Results of radiotherapy for orbital and adnexal lymphoma. Orbit. 2002 Jun. 21(2):117-23. [Medline]. Berenbom A, Davila RM, Lin HS, Harbour JW. Treatment outcomes for primary intraocular lymphoma: implications for external beam radiotherapy. Eye. 2007 Sep. 21(9):1198-201. [Medline]. Matsuo T, Yoshino T. Long-term follow-up results of observation or radiation for conjunctival malignant lymphoma. Ophthalmology. 2004 Jun. 111(6):1233-7. [Medline]. Eichler MD, Fraunfelder FT. Cryotherapy for conjunctival lymphoid tumors. Am J Ophthalmol. 1994 Oct 15. 118(4):463-7. [Medline]. Esmaeli B, Ahmadi MA, Manning J, McLaughlin PW, Ginsberg L. Clinical presentation and treatment of secondary orbital lymphoma. Ophthal Plast Reconstr Surg. 2002 Jul. 18(4):247-53. [Medline]. Martinet S, Ozsahin M, Belkacemi Y, Landmann C, Poortmans P, Oehlere C, et al. Outcome and prognostic factors in orbital lymphoma: a Rare Cancer Network study on 90 consecutive patients treated with radiotherapy. Int J Radiat Oncol Biol Phys. 2003 Mar 15. 55(4):892-8. [Medline]. Cheah CY, Milgrom S, Chihara D, Gombos DS, Pinnix CC, Dabaja BS, et al. Intensive chemoimmunotherapy and bilateral globe irradiation as initial therapy for primary intraocular lymphoma. Neuro Oncol. 2015 Oct 20. [Medline]. Benabid L, Desablens B, Defossez T, Malthieu D, Milazzo S, Turut P. [New treatment for orbital non-Hodgkin's lymphoma: 2 cases treated with rituximab]. J Fr Ophtalmol. 2005 Sep. 28(7):769-71. [Medline]. Savino G, Battendieri R, Gari M, Caputo CG, Laurenti L, Blasi MA. Long-term outcomes of primary ocular adnexal lymphoma treatment with intraorbital rituximab injections. J Cancer Res Clin Oncol. 2013 Apr 27. [Medline]. Bardenstein DS. Intraocular Lymphoma. Cancer Control. 1998 Jul. 5(4):317-325. [Medline]. McKelvie PA, McNab A, Francis IC, Fox R, O'Day J. Ocular adnexal lymphoproliferative disease: a series of 73 cases. Clin Experiment Ophthalmol. 2001 Dec. 29(6):387-93. [Medline]. Woog JJ, Kim YD, Yeatts RP, Kim S, Esmaeli B, Kikkawa D, et al. Natural killer/T-cell lymphoma with ocular and adnexal involvement. Ophthalmology. 2006 Jan. 113(1):140-7. [Medline]. Jakobiec FA, Knowles DM. An overview of ocular adnexal lymphoid tumors. Trans Am Ophthalmol Soc. 1989. 87:420-42; discussion 442-4. [Medline]. Jenkins C, Rose GE, Bunce C, Cree I, Norton A, Plowman PN, et al. Clinical features associated with survival of patients with lymphoma of the ocular adnexa. Eye. 2003 Oct. 17(7):809-20. [Medline]. Choung H, Kim YA, Kim N, Lee MJ, Khwarg SI. Clinicopathologic Study of Chromosomal Aberrations in Ocular Adnexal Lymphomas of Korean Patients. Korean J Ophthalmol. 2015 Oct. 29 (5):285-93. [Medline]. Pulido JS, Johnston PB, Nowakowski GS, Castellino A, Raja H. The diagnosis and treatment of primary vitreoretinal lymphoma: a review. Int J Retina Vitreous. 2018. 4:18. [Medline]. Tang LJ, Gu CL, Zhang P. Intraocular lymphoma. Int J Ophthalmol. 2017. 10 (8):1301-1307. [Medline].